A spicy peanut sauce takes these chicken wings to the next level. The peanut sauce includes some chili paste, sesame oil, and soy sauce for an Asian-inspired chicken wing appetizer that will please even the most discerning palates. Serve the blissful sauce on the side for dipping and garnish the wings and sauce with chopped roasted peanuts. Sambal is an Asian chili paste made with chili peppers, garlic, and other flavorful ingredients. If you want less spicy wings, taste as you go and adjust the amount of sambal to suit your taste. The wings are also surprisingly easy to prepare and bake, and you probably have most, if not all of the ingredients in your pantry. 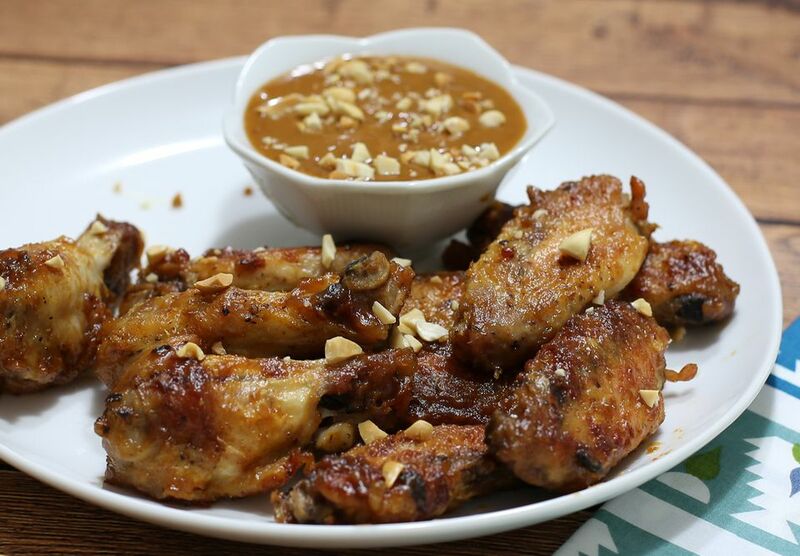 The wings are simply baked and then tossed with the peanut sauce. As a party appetizer, plan on about 2 wings per person. If there are not many other appetizers, plan on 4 per person. Serve the chicken wings to the game day crowd or make them for a family meal. Your friends and family will love them! Cut the wing tips off and discard. Cut the wings at the joint. In a saucepan over medium heat, combine the peanut butter, brown sugar, water, rice vinegar, soy sauce, chili paste, sesame oil, and garlic. Bring to a simmer. Cook, stirring, for 2 minutes. Remove from the heat and set aside. Heat the oven to 400 F. Line a large rimmed baking pan with foil. In a large bowl, toss the chicken wings with the vegetable oil and hot sauce. Arrange the wings on the prepared baking sheet. Bake the wings for 20 minutes. Remove the pan from the oven. With tongs, turn all of the wing pieces over. Return the pan to the oven and continue baking for 15 to 20 minutes longer, until nicely browned and cooked. Juices should be clear, not pink when the wings are ready. Transfer the cooked wings to a large bowl and add about half of the peanut sauce. Gently toss the wings to coat with the sauce. Serve the remaining peanut sauce along with the wings. If the sauce is very thick, thin it with a small amount of water. Garnish the sauce and the chicken wings with chopped peanuts, if desired. A pound of chicken wings yields approximately 6 whole wings or 12 separate pieces.